This is Siesta Beach during low season. 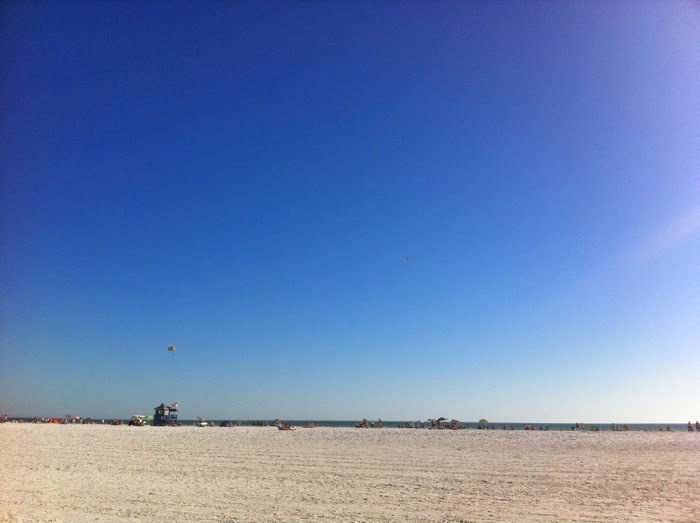 Although in Sarasota, FL, where Siesta Beach is located, low season is actually high season -- when the "snowbirds" flock to their winter homes from places as far as Canada, England, Germany and beyond. Siesta Beach has several times been named the Number One Beach in the United States, as it's famous for its white sands -- composed of 99% quartz. It's a tall order to fill, and led to mild disappointment on this quiet late afternoon. I'd visited once before, when I was nine years old, but the sign of a quality beach back then rested solely on my ability to get into the water and stay in the water without any trouble. As I strolled along, I thought of how endless the beach seemed, how wide it was. And I tried to imagine what it would look like, peppered with a rainbow of umbrellas and swimwear, in the months to come. It's a quiet beach in the low season, and there isn't much to look at -- just the same parasailers hovering deceptively closer and closer until suddenly they're further away again. Two children's kites dangerously close to becoming entangled. It's not like Miami Beach or the beaches of southern Italy or even Long Island, which have built-in scenery around the water -- some natural, some not. This beach, on this particular day, seemed like the epitome of Sarasota -- a mix of young and old, high-brow and low-brow -- all coexisting, quietly. Nearby, there's a small eating pavilion, with a gourmet popsicle stand and other types of surprisingly eclectic pop-up eateries. I saw a teenaged girl walking alone on the beach, backpack hanging loosely from her sunkissed shoulders and a bright red, half-eaten popsicle in her hand ... and I wondered what it would've been like to have grown up in a place like this, with the country's so-called best beach as your afterschool hangout. And how difficult it must be to pull yourself away, when it's time to go.